In 3-quart saucepan, heat milk and grated gingerroot over low heat about 5 minutes, stirring frequently, until very hot but not boiling. In medium bowl with electric mixer, beat egg yolks and sugar on medium speed 4 to 6 minutes or until pale yellow. Beat in flour. Gradually beat in warm milk mixture until well blended. Return mixture to saucepan; cook over medium-low heat about 5 minutes, stirring constantly, until mixture is very thick and begins to boil. Boil 1 minute, stirring constantly. Remove from heat; stir in butter and vanilla. Pour into medium bowl; place plastic wrap on surface of pastry cream. Refrigerate until completely cooled, about 1 hour. Meanwhile, heat oven to 450°F. Prepare pie crust as directed on package for one-crust baked shell using 9-inch tart pan with removable bottom or 9-inch pie pan. Trim edges if necessary. Bake 9 to 11 minutes or until lightly browned. Cool completely, about 15 minutes. Fill baked shell with pastry cream. 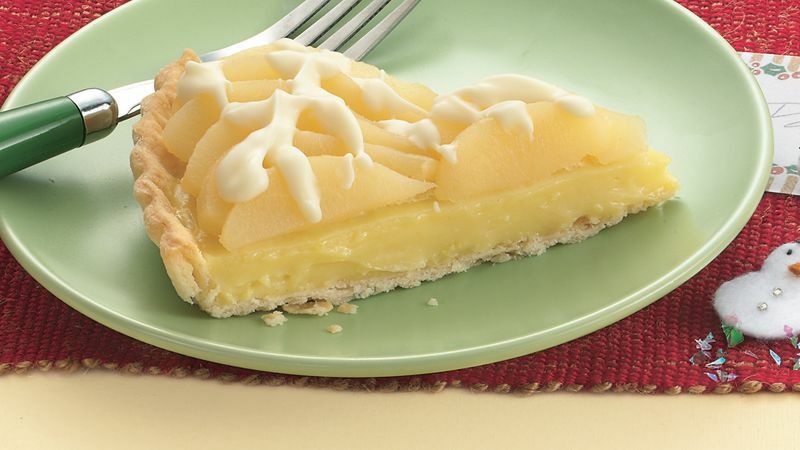 Cut pear halves into thin slices; arrange on top of tart. In small microwavable bowl, microwave baking bar and shortening on High 45 to 60 seconds, stirring once halfway through microwaving, until melted. If necessary, continue to microwave on High in 15-second increments, stirring until smooth. Drizzle over tart. Store in refrigerator. Tightly wrap any leftover fresh gingerroot and freeze for up to 6 months. Grate what you need from the frozen gingerroot, re-wrap and return it to the freezer.